The weight is evenly dispersed while the strap functions as a shock absorber to eliminate neck and shoulder fatigue. Evenly distributes weight with curved neoprene pad. Materials Neoprene pad with Non Slip Grip™, nylon webbing and leather tabs. Double Dual Shoulder Strap Belt Holster Nikon D750 D810 D3300 D4S All Models. The pin is made of highly durable stainless steel. Tripod Heads & Supports. Tethering Tools. Photo Accessories. iPhone & iPad Photo Gear. Gear Protection. Flash & Lighting. Demo Delights. Made from strong 6mm Orange marine rope/cord, with black thread. Mamiya (except M645 Super & M645 Pro). 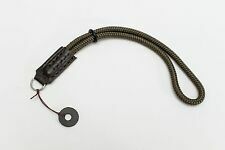 It is for a pair of strap connectors only. Op/Tech Super Pro "B" Connectors. This strap has a unique connection system for especially tight connection points. This easy-to-attach connection system is a great alternative to OP/TECH USA's patented connector. Evenly distributes weight with curved neoprene pad. Emio 0201 The Original Go Stick Never miss that perfect angle! Life doesn't stop at the end of your arm, so don't limit the action — capture the whole story with the Go Stick set! GoPro compatible. Easy to install, simply thread the split side through the strap lug. Made of solid stainless steel, these Split Triangular-Rings are both strong and durable. Made from breathable, lightweight materials, it can easily be adjusted to comfortably fit a wide range of body types. Padded and breathable materials stay comfortable during any activity. Standard 3-Prong Mount. 1) x Nikon Camera Straps of Woodpecker Model Commemorative - Stylish woodpecker Embroidery design and comfortable padded strap reduces stress to the neck. - Adjustable length for added comfort and ease of use. - Length: 25.2" - Width: 1.5" Premium Photo Camera Green Neck/Shoulder Sling Strap Bird Design for Nikon DSLR Camera D90 D40 D60 D3000 by Loadstone Studio See pictures for details. 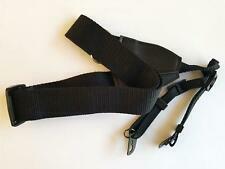 Strap is 1.5" wide with secure adjustable connecters. Strap has Nikon embossed in yellow on it. Strap is 38" long. Made of glass-reinforced nylon with machined aluminium bayonet mounts. Holds your lens securely using the lens bayonet mount. Compatible with Sony E/EF-Mount. Swivels freely for quick lens changing, but locks in 4 directions to keep your unused lens secure. Footprint wrist strap hand made in the UK with Sedgwick's. finestEnglish bridle leather. 3/8" wide. Flickr pages. Camera Strap Lug Ring Protector suits most SLR, Mirrorless and Rangefinders. - With double hooks for easy attach to bags or pouches - Adjustable length with the buckle - With a piece of padded cloth for comfortable carrying - Color: Black Dimension: Strap 55.5 inches (length) x 1.5 inches (width) Padding 8.5 inches (length) x 3.5 inches (width) (It's manual measurement, there may be a little error.) 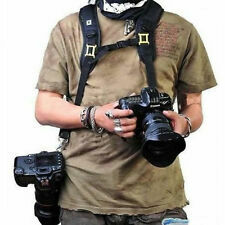 Package include: 1x Black adjustable strap with silver/ chrome hook Camera bag not included!.